The new chief executive of Thames Water is having his bonus scrapped for two years, following anger over leaks and the company’s overseas structure. Steve Robertson will get no bonus until 2020, the firm is set to announce today. However, he could get a maximum of £3.75m after that if he minimises leakages and reduces pollution before then. The overhaul of the firm’s bonus scheme, which will be unveiled in its annual report, breaks from UK corporate tradition in that his bonus will not be linked to financial performance. But he could be in line for even more cash than he would receive under the current scheme. Had he hit all performance targets Robertson would have walked away with £2.14m this year. This will rise by £1.61m when the new bonus targets come in. It has not yet been decided whether or not the reformed bonus structure will continue to apply after 2020. Water regulator Ofwat has criticised suppliers for giving their executives massive payouts while failing to patch up networks of aging and unreliable pipes. 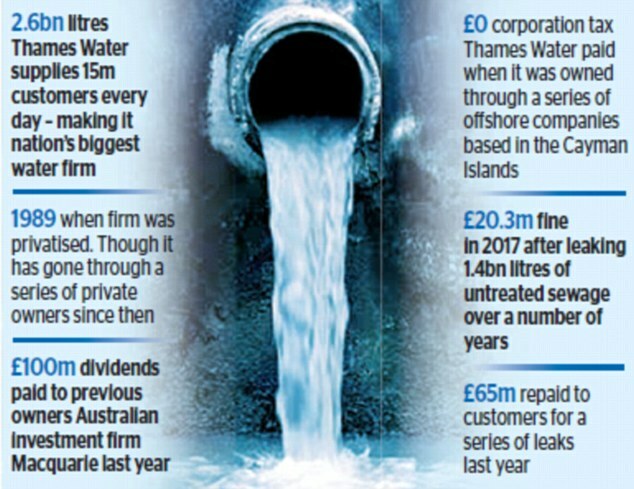 Thames Water in particular raised eyebrows when it gave Robertson a bonus of £54,000 last year, after the firm was fined £20m in March for allowing raw sewage into the Thames between 2012 and 2014 and another £8.6m in June for missing leak reduction targets. Thames Water’s changes may now pressure its competitors to implement similar structures. It comes after it emerged a staggering £58m has flowed into the pockets of nine water firms’ fat cats in five years, a probe has found. Steve Mogford, 61, of United Utilities, which serves three million homes in the North West, has earned around £12m since 2013. Last year, Pennon Group, which owns South West Water, awarded its boss Chris Loughlin a total of £1.15m against a base salary of £518,000. Meanwhile Severn Trent’s chief executive Liv Garfield was awarded a massive £2.08m on top of a base salary of £687,200. Ofwat said earlier this month that Thames Water would return a total of £120m to its customers, as a result of missing commitments it had made to fix pipes. After an investigation of the company, Ofwat found Thames Water had breached its legal obligations of having sufficient oversight and control of leakages. Thames Water did not comment last night.